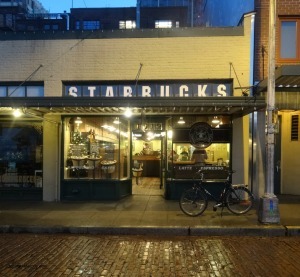 At about 7:00 AM this morning, I stopped by the 1912 Pike Place Starbucks. The sun was still coming up. The brick in front of 1912 Pike Place was a little wet from a quintessential Seattle drizzle. And lo and behold, there was a bike directly in front of the store. I froze in awe. I snapped a photo and thought that somehow this moment oozed charm. So beautiful – and so I’m sharing it here, in case you are in awe too. Did you know that this store opened April 1, 1971? Did you know that Starbucks was nearly named “Cargo House” by the original founders? “Cargo House” wouldn’t have looked nearly as great above the windows of the store! I hope you can come by and visit soon! 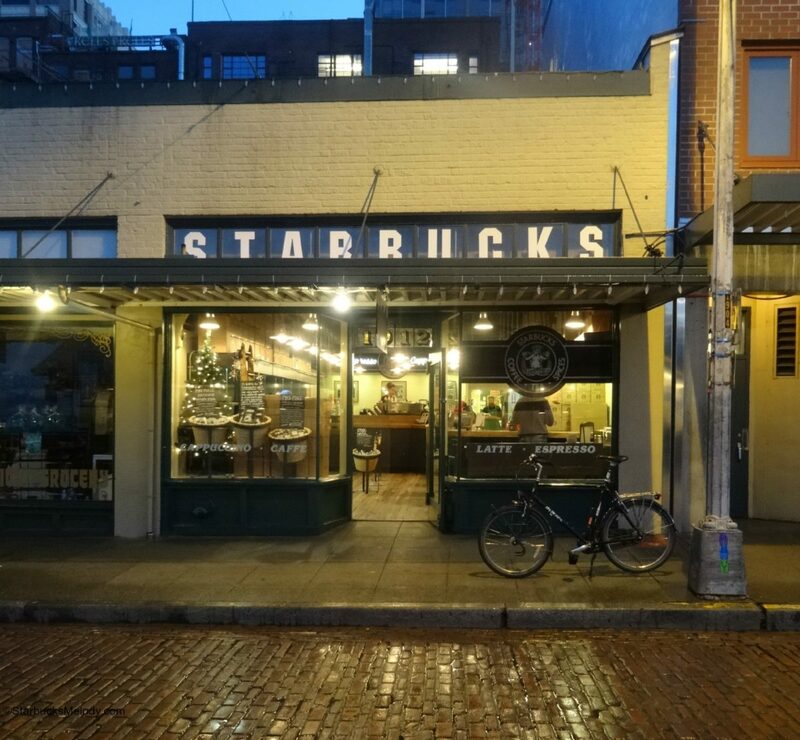 Have you ever been to the 1912 Pike Place Starbucks? Starbucks in Spokane to donate proceeds from sales to hunger relief organization, 2nd Harvest! A Close Up Look at the 1912 Pike Place Starbucks. I have been to the “original” Starbucks twice. It’s really a trip back in time and very cool. There’s also merchandise you can only get there – I have a cool travel mug from there. You need to be prepared to stand in line usually but it’s worth the wait! I think they should make a gift card from the image. Yes, have been to this store. Melody, a wonderful pic as others have said. You certainly have caught the store at its best. It’s a lovely picture and makes me miss Seattle deeply. Put this on our agenda, Melody! I visited last month when I was in Seattle. (aside: I accidentally stumbled across the Roastery, too!) We stopped by in the evening…probably 7ish, after most people cleared from the market. It was nice to be able to chat with the partners for a few minutes and get a bag of Pike Place Reserve as my markout 🙂 Neat little store. I learned that one partner was leaving and I wanted to BEG for a transfer. I fell in love with Seattle.